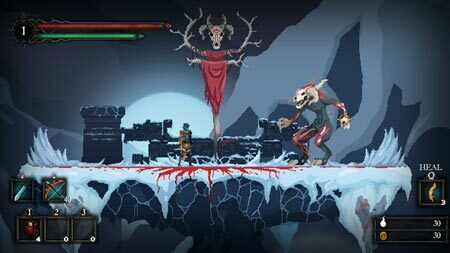 Death’s Gambit is a challenging 2D action platformer with deep RPG elements by White Rabbit. As an agent of Death bound to his service, unravel the mystery of Siradon and discover the true price of immortality. The promise of immortality lies at the heart of Siradon. As Death’s right hand, challenge the undying guardians of the realm and endure the eternal struggle to purge their souls. Travel across the beautifully rendered Obsidian Vale, Witch Woods, Sanguine City, and more. Meet quirky characters from all walks of life, and uncover their narrative threads and secrets. Choose from seven playable classes, level up, pick your favorite talents from the skill tree, adapt your strategies, and improve your chances of survival. Master the precise combat, utilizing a wide variety of weapons and abilities to confront the horrors that lurk deep within Siradon. Explore a mysterious and unforgiving world to uncover the true price of immortality. Embrace the challenge of being an agent of Death. Hunt towering monsters and other creatures of legend. Each boss is a test of skill, requiring unique strategies to defeat. Explore levels and bosses in a non-linear order, discover side areas with more secrets to unravel and enemies to purge. If you get stuck in the game, check out the video walkthrough and gameplay for the game. This entry was posted in PC Games, Walkthrough and tagged Death's Gambit Cheats, Death's Gambit Game, Death's Gambit Gameplay, Death's Gambit Guide, Death's Gambit Hints, Death's Gambit Review, Death's Gambit Solutions, Death's Gambit Strategy, Death's Gambit Tips, Death's Gambit Walkthrough by Marvin. Bookmark the permalink.